Street Sweepers: Stormwater Management Tools or Only Street Beautification Machines? I recently received an email from the long-time street division supervisor of a Pacific Northwest city of about 100,000 population. The city is located on a portion of Puget Sound. The question was, put succinctly "Do sweepers have a stormwater function, or just a Street Division function? I've always thought that sweepers are there to keep rocks and debris off the streets and to keep the material out of catchbasins. They are also used to keep the grass from encroaching onto the shoulder. My belief has been that catchbasin cleaners are then used to clean the catchbasins and that is where the stormwater function comes in." My answer is this: The days of sweeping as strictly a cosmetic practice should be long gone from any city's public works department – even more so for any locale where stormwater runoff has an opportunity to drain into public or private waterways. Catchbasin cleaning is still necessary no matter how good a job a sweeper does. However, the amount of catchbasin cleaning and other mitigation processes that will be needed can be affected greatly by the work of the sweepers deployed upstream. It is well documented that sweepers are a much more cost-effective pollutant removal method than most any other methodology further downstream. In addition, at the catchbasin level of removal, most if not all of the water-soluble pollutants will pass through catchbasin filtration systems. Since about half of the pollutants targeted by the EPA as problem metals, etc., are water soluble, it's much preferred to remove them at the street sweeping level, not later on downstream. Making this problem even more difficult to address is the fact that the typical 30% of street debris that's 250 microns and smaller (human hair is about 72 microns) contain over 50% of the total amount of runoff pollutants targeted by the USEPA Clean Water Act. Since air sweepers are, on average, better at small particle removal, they are becoming the preferred method for sweeping where stormwater pollution runoff is an issue. These days, many cities have significant resources to use in targeting pollution removal at the end of the pipe. For that reason, I recommend that city sweeping departments and stormwater departments become combined. When facts like the above are known and a localized cost/benefit analysis is done, most city managers will discover they should be conducting more frequent, more thorough sweeping, and doing so with the type of sweepers that will do the best job of stormwater pollutant removal for their street types and locale. Only when the cost/benefit curves intersect, such that the cost of picking up the last pound of pollutants with a BMP sweeper equals the cost of removing the first pound via an end-of-the-pipe method, the correct ratio of sweeping to other stormwater pollution removal practices will have been attained. The WorldSweeper website offers the world's largest collection of sweeping studies, best practices and other environmental resources that can be invaluable to city managers in this regard. For a general overview, I highly recommend the PDF handout I wrote on this general topic, entitled "Historical and Current Overview on Characteristics and Capabilities of Street-Class Power Sweepers." When it comes to resource scarcity, make no mistake that clean water tops the list of most futurists. Do not delay in implementing the correct ratio of sweeping and end-of-the-pipe best practices to ensure your city doesn't end up behind the proverbial eight ball. If you have any news of potential interest to the power sweeping community, please let us know. Between this publication, the WorldSweeper.com website, and the World Sweeping Association, we'll be sure to get the information passed along to interested readers. 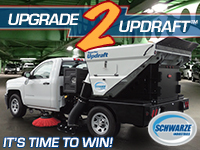 In recent months of 2014 the World Sweeper office has received a number of reports, primarily from parking lot sweeping contractors, concerning trouble they were having with the fuel systems on their Isuzu chassis. These seemed to especially concern the 2006 and 2007 model years. Initial speculation centered around the idea that the reported issues could be the result of the 2008 model year changes, by Isuzu and other manufacturers, that were mandated by the federal government. We contacted Isuzu and provided the company representatives with our collected information. In this article we are providing the response from two top members of the U.S. Isuzu management team, Jim Barnes, Manager of Regional Fleet Sales and Mike Rossetti, Isuzu Commercial Truck's Director of Field Operations. This article also includes the approximately 26-minute audio interview held with both men. In the audio, the issue is discussed at length and various ideas are put forward to minimize problems with the Isuzu fuel system, as well as discussing ways to maximize most any fuel system's longevity. Read and listen to the article. In Calgary, Alberta – which is located in the western portion of Canada – there has been a tradition of affixing giant 'street sweeper critters' onto the city's sweepers for cleaning up after the City's celebrated Calgary Stampede festivity events. 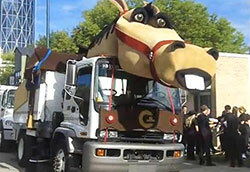 In 2001, the City introduced parade watchers to Dixie, Samson, Rocky and Alfalfa, four critters created by a local puppeteer that were fitted onto street sweepers used to clean up the parade route. The four traveled the City's parade circuit for the last time on August 4th of 2014. Reportedly, the four critters will be transferred to 'greener pastures.' To see photos of the critters and read more of the story, use the link below. Check out the Calgary Critters. United Rotary Brush (URB) is pleased to announce the acquisition of the operating assets from West Coast Equipment (WCE), a family-owned business headquartered in Glendale, AZ. WCE is a leading manufacturer of after-market street sweeping brooms in the southwest. The acquisition of West Coast Equipment's operating assets builds on the foundation of west coast service leadership that United Rotary made in 2010 when the company purchased American Rotary Broom. Rodney Olson, CEO of United Rotary Brush, explains; "Phil and Sue Prohoroff established West Coast Equipment in 1988. They built a strong regional rotary brush company and helped shape the industry, especially through Phil's speed-plate innovation. Phil unfortunately became ill and was unable to participate in the last four years of growth, which were led by his sister-in-law Lissa Haprov." One of the two sweeper books is called "Street Sweepers (Mighty Machines)" and is part of the Capstone Press 'Mighty Machines Series,' which includes overviews on a number of different types of heavy equipment. The intent of the series is to provide children with factual information, with many large illustrations, of how the various machines operate. The images support early readers in understanding the text. The other book, titled "The Mighty Street Sweeper," offers information about the different parts of a sweeper. Because it's a kid's book, several pages discuss what a sweeper isn't by contrasting it with other work vehicles. The book receives high ratings by purchasers and is designed for ages 3-5. Check out these books and other sweeper-oriented toys. Dustin Beaver first started working for Victory Sweepers Inc. in July of 2007, as the demonstrator for Victory's new line of air sweepers. In that position, he traveled all over the country meeting with contractors. In 2009, Dustin started selling sweepers and also became Victory's used sweeper manager. During this time he also learned how to do field repairs as well as write the owners manuals for the new products Victory was launching. Dustin left Victory in July of 2010 to pursue an opportunity in automobile sales and management, where he ultimately increased the sales of the dealership he managed by over 50%. However, Dustin Beaver has now returned to rejoin the sales team at Victory Sweepers, Inc. Check out the Victory Sweepers press release. HR Sweeping was originally founded in the 1970s by, Vincent Hacker, a former airplane designer. The business was started with a Bel-Aire sweeper and the somewhat unheard of business model was to get parking lots clear of debris. The company's use of technology has changed somewhat since its inception, as has their service area, and the firm's legacy is now carried on by the founder's daughter, Sharon. What hasn't changed is HR Sweeping's commitment to keeping their customers satisfied no matter what – even if it comes to using a broom, dustpan and wheelbarrow. Current owner/operator, Sharon Bausch, has been involved with the company in a full-time role since 1999, which was the year HR Sweeping's founder and Bausch's father, Vincent Hacker (shown in the photo to the right), passed away. Announcement reads: When properly implemented, GPS vehicle tracking systems can generate positive results in many areas, but for most fleet managers, what really stands out is telematics' ability to help lower operational expenses. That's why more and more fleet operators are turning to telematics as an effective solution for managing their fleets within limited budgets. Announcement reads: Employers are often advised to "document, document, document," but maintaining proper and complete documentation requires more than simply writing down the details and putting them in a file. Many records must be kept for specified periods of time, and certain records must be maintained separately from personnel files. Failure to keep accurate files can also create liability for the employer if those records are needed to refute a legal claim, or if confidential information is inadvertently released. Maintaining miscellaneous records such as receipts for employee handbooks. It may be hard to find a more perfect embodiment of the axiom "One man's trash is another man's treasure" than New York City sanitation worker Nelson Molina's collection. Tucked in the far corner of an otherwise elegant neighborhood, on 99th Street between First and Second Avenues, lives one of the Sanitation Department's garages. Dark and naturally dingy, it's a place busy and polished New Yorkers would typically pass by without a second glance. However, if you did walk into the nondescript building, past the musty garbage trucks and up the rusty staircase to the second floor, you would find a place you could have never imagined. 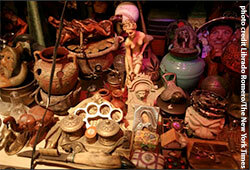 "Treasure in the Trash by Nelson Molina" a sign announces in a wonderfully spacious room exploding in a riot of objects – paintings, posters and photographs hung neatly on every wall, colorful bric-a-brac lining every corner. See more at the weblink shown below. Thanks for reading WorldSweeper.com's August 2014 Newsletter!